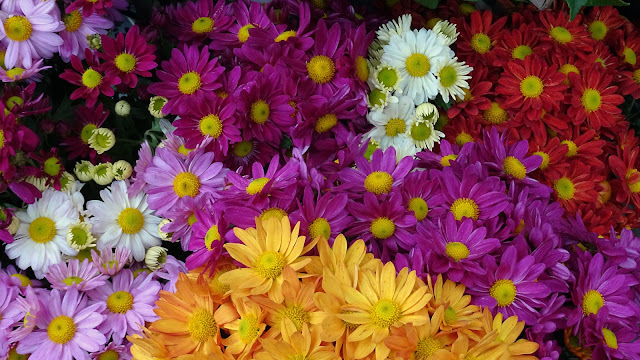 Although once referred to as Dendranthema, the florists chrysanthemum is now correctly known under its old name. There are about 40 species in the genus Chrysanthemum, mainly from East Asia. In China, where they have been cultivated for over 2,500 years, the chrysanthemum was used medicinally and for flavouring, as well as for ornament. All chrysanthemum flowers are edible, but the flavor varies widely from plant to plant, from sweet to tangy to bitter or peppery. It may take some experimentation to find flavours you like. The flower is also significant in Japan where it is a symbol of happiness and longevity, and the royal family has ruled for 2,600 years from the Chrysanthemum Throne. The annual species are referred to Xanthophthalmum and are mainly used for summer bedding or as fillers in borders of perennial flowers. Most chrysanthemums are upright plants with lobed leaves that can be aromatic. The many showy flowerheads, carried at the tips of strong stems, begin to bloom as the days shorten. Florists chrysanthemums (Chrysanthemum grandiflorum) are grouped according to form: Irregular incurved, reflexed, regular incurved, intermediate incurved, pompon, single and semi-double, anemone, spoon, quill, spider, brush or thistle, and unclassified, which is a catch-all group for blooms not yet classified or not falling into one of the existing groups. Beautiful in colors, reminds me of India. what wonderful colors, so fresh and so beautiful! this is such a powerful image - great colors! !